Pack 3 Activation : New activation from Sigma Key team for FRP remowal of Hi-Silicon and Qualcomm Huawei Android Cell phones. Every Sigma Box, dongle, key owner can activate Pack 3 and get access to these particular and future features that will be added as new updated for Sigma pack 3, which will be introduced in this Pack. Released FRP REMOVE feature for the newest group of Qcom Alcatel/Vodafone models with Android 5.1 and higher. Added unlimited FRP REMOVE feature for the newest group of Huawei MTK models. 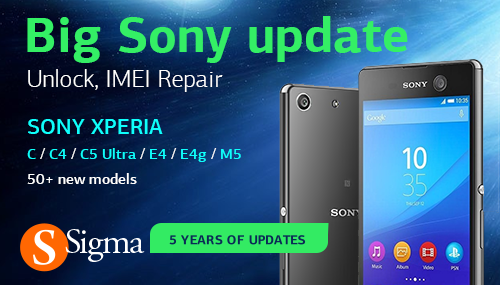 We are glad to announce a release of Unlock, IMEI Repair and Wrong Code Counter Reset functions for Sony Xperia C / C4 / C5 Ultra / E4 / E4g / M5 smartphones. "0" attempt left / Counter blocked phones are supported! Root required. Tested on devices running Android 4.x / 5.x. Please note that Sigma Box/Key is required to use this activation.